The original article was published on Nutrition RapidSMS. To read the complete article, click here. I was just talking to my friend who reminded me about failure and fridays. It’s friday. We never really like to talk about failure – but let’s do it anyhow. MUAC strips are very cheap and perfectly tailored to identify of acute malnutrition in children in community and clinic based programs. Their use has allowed an enormous increase in scale of management of severe acute malnutrition programming that has saved the lives of hundreds of thousands of children or more over the past decades. In nutrition surveys and academic research where robust measurement tools are needed, these MUAC strips are disappointing. Repeated analyses from standardization exercises for nutrition surveys demonstrate that the MUAC strip measures have a variation of between 8 – 10 mm due to the lack of a standard tension applied to the strip at the moment of measure. The average of all MUAC measures from anthropometrists measuring 10 children twice is presented above. If there was no measurement error, then all results would have the same general value. 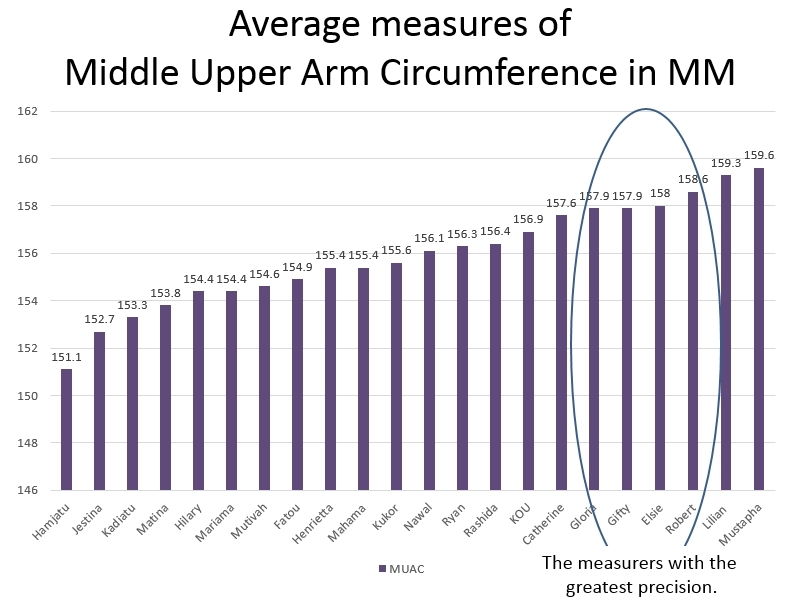 Research on the accuracy and precision of MUAC measures showed that in national surveys MUAC measures in had more measurement error / poorer precision than weight and height measures. Only the most experienced data collection staff can achieve an acceptable precision (+/- 2 mm) with MUAC measures. The wider range of precision which we are forced to accept for reasons of expediency creates difficulties to achieve an acceptable accuracy with the MUAC measures. Observer variability in MUAC measures is caused by setting the band too tight or too loose. The lack of standard tension creates measurement error that is often not random. In the training reported above, the anthropometrists with acceptable levels of precision pulled the strip less tightly than those who had poorer precision and less experience with measuring children. This bias could significantly inflate the prevalence of acute malnutrition in survey results if not addressed properly before the start of the survey. In the past, poor and inaccurate survey results has lead to unacceptable misuse and waste of financial and human resources. The Gates Global Challenge put out a call to develop innovative methods to measure MUAC. They were also looking for other alternative approaches to measure child’s malnutrition status such as use of technologies to measure fat deposits beneath the skin or other electronic technologies to create easy to use anthropometric assessments of malnutrition status. Hopefully something positive will come out of the results from this initiative.